Malabar Gladeye Bushbrown, whose scientific name is Mycalesis junonia is a member of the Nymphalidae family of butterflies. This butterfly is quite common in Kerala, especially the forests of Sahyadri region. And it is considered as a common butterfly in its range. I have photographed it from Periyar and Chinnar Wildlife Sanctuary so far. The one from Periyar was not up to the mark, so posting the other one here. It was around noon when I clicked this picture. We were trekking the way back from Thoovanam waterfalls. First the butterfly was resting on a leaf or something. Quickly changed the lens from wide angle to macro. Just before this, I was photographing the waterfalls with the wide angle lens. Also since it was hot noon, we were not expecting to see much butterflies. By the time, it had moved to this rock. It sat there patiently for sometime, which was enough for me to click some good shots. Finally we left it there and returned. As the name suggests, it is one of the bushbrown butterflies found in India. Almost all of these butterflies have some variation of brown color as the primary color.Malabar Gladeye Bushbrown is also no different. The primary color is light brown. This is an easy to identify butterfly. The big spot on the under fore wing is the key. This is a big white spot with black spot inside it which is not centered. The butterfly in photo 1 is a dry season form probably. So the marks and spots are less prominent. Based on the photo, there is also a small spot towards the apex of under fore wing. The under hind wing have mainly five small spots on the post-discal region. The two spots nearer to the tornus is even smaller. All these spots, be it on fore wing or hind wing, is surrounded by ashy or silvery circles. These circles are bright and prominent in some. There is a long line running on the discal area from fore wing to hind wing. This has two strokes, one silvery and other reddish. There are also smaller reddish lines towards the basal area. The size is medium, with about 40 mm wingspan. 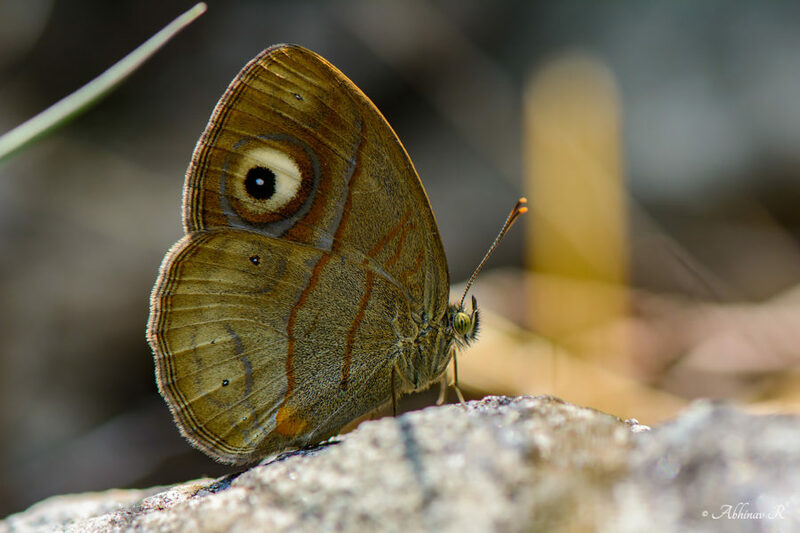 Also I could learn that it is also considered as a subspecies of the Gladeye Bushbrown found in Sri Lanka, whose scientific name is Mycalesis patnia. Also, I hope to add more photos from different places. For now, let us appreciate the beauty of this little being.